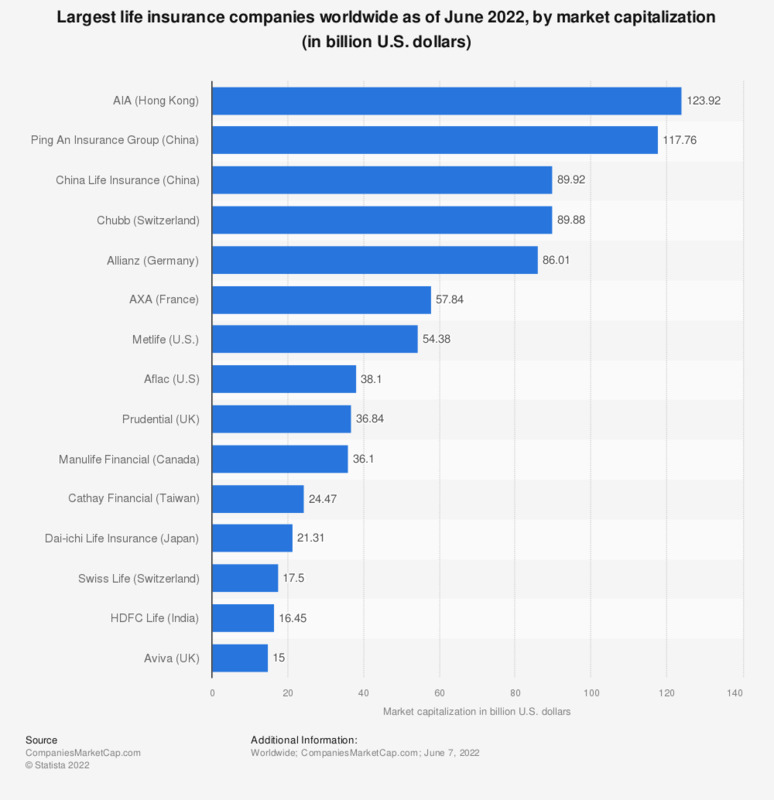 As well as China Life Insurance, other leading life insurance companies in terms of market capitalization worldwide in 2017, were Ping An from China (93.48 billion U.S. dollars), AIA Group from Hong Kong (68.02 billion U.S. dollars), and AXA from France (62.13 billion U.S. dollars). In the United States, the ranking of life insurers with largest market capitalization as of February 2016 displays the following results: MetLife ranked highest (49.22 billion U.S. dollars), followed by Prudential Financial (31.03 billion U.S. dollars), Aflac (24.73 billion U.S. dollars), Principal Financial (11.05 billion U.S. dollars) and Lincoln Financial (9.77 billion U.S. dollars). When taking total assets into consideration, MetLife (607.59 billion U.S. dollars), followed by Prudential Financial (541.27 billion U.S. dollars), New York Life (287.76 billion U.S. dollars) proved to be the largest life insurance companies in the United States in 2016. The United States proved to be the country with highest value of life insurance premiums written in 2015, with premiums amounting to approximately 552.51 billion U.S. dollars. Other leading world countries in terms of value of life insurance premiums written were Japan (343.82 billion U.S. dollars), United Kingdom (214.49 billion U.S. dollars) and China (210.76 billion U.S. dollars). Everything On "Life insurance worldwide" in One Document: Edited and Divided into Handy Chapters. Including Detailed References.